Choice is good, and when it comes to setting up a smart home, you simply can't have enough. 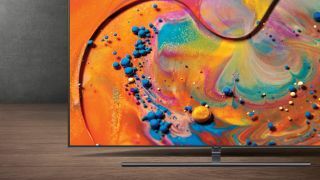 Samsung seems to have realized this, with rumors circulating that it's adding a welcome smart feature to its range of TVs at CES 2019. According to Variety, Samsung intends to bring the Google Assistant smart home voice helper to its televisions next year. Samsung already has its own voice assistant, Bixby, in some of its sets, but the suggestion here is that you'll be given the choice as to which AI helper will be taking charge of your TV – a wise move on Samsung's part, given that Bixby still has a long way to go until it can compete with Assistant and Alexa. The upgrades won't be limited to a voice assistant either. Trademarks have been filed which point to Samsung working on new audio technology for its televisions. Centring on spatial sound and intelligent volume, this looks to mimic what Apple's HomePod achieves, understanding its environment to adjust audio settings accordingly. Better audio is always appreciated when it comes to the middling performance from flatscreen panels. But Samsung conceding that consumers want the choice of options other than its Bixby assistant is very interesting, and could pave the way for bipartisan smart home integration to come.